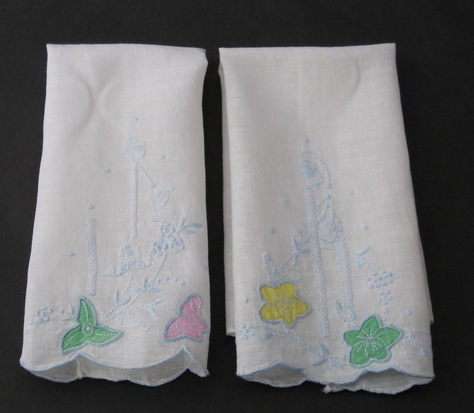 Set of 4 dainty fingertip towels in snowy white linen with pastel blue embroidery on the ground and scalloped edge. All have appliqued flower decoration, 2 in yellow and green and 2 in pink and green. Delicate floral motif towels bring an elegant look to a powder room and add a touch of retro hostess glam. Excellent condition. No tears, holes, or pulled threads.